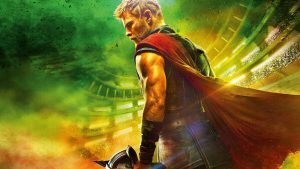 Thor: Ragnarok, directed by Taika Waititi, and starring Chris Hemsworth, is the third Thor film and the seventeenth film by Marvel Studios. Kyle Willoughby and Claire White are always happy to go on a cosmic adventure, especially when they can blend mythology with big studio productions. Claire begins by breaking down the original Norse versions of Thor, and Ragnarok. She then goes on to compare them to their comic book versions and explains why Stan Lee thought to bring a Norse god into the comics in the first place. Kyle digs into the production and the efforts of the director to break from the failings of Thor: The Dark World. He even attempts to distill fact from joke in Waititi’s interviews. Our hosts conclude with their thoughts on the movie’s goofy humor, their favorite characters, and the studio’s willingness to shift directions.